Killala Quay can make the most of both a drop back in trip and dip in class in the Great Glen Novices’ Chase at Leicester. 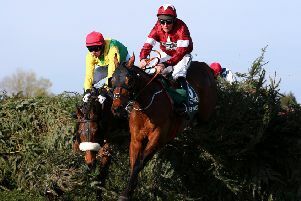 Charlie Longsdon stepped his seven-year-old up to Grade Two level over three miles at Doncaster earlier in the month and it appeared to prove just too big an ask for Killala Quayat this stage of the season. He did not seem to stay the trip and was in trouble from some way out, eventually finishing a tailed-off third of four runners after being eased when beaten. Killala Quay had previously finished an eight-length second to Puffin Billy at Ascot on his fencing bow and while that rival hardly enhanced the form when falling on his subsequent start, he remains a well-regarded type. Longsdon seems to have found an excellent opportunity for his charge in this more low-key event. Retrieve was Group One placed on the flat in Australia in his pomp and was good enough to chase home Novellist in Italy at one point, but following a long absence, he looked a thoroughly useful recruit for John Ferguson over hurdles last term. While he did not prove to be top-class as was perhaps hoped, he did manage to win a maiden hurdle at Stratford in July before being edged into second at the same track just 12 days later. He was collared on the line that day but following a lengthy summer break, he returns on a highly workable mark in the Leicestershire Bronze Fox Handicap Hurdle. Frederic can make a winning start for Donald McCain in the first division of the Watch On 3 Devices racinguk.com/anywhere Maiden Hurdle at Catterick after showing some ability for Luca Cumani on the level. He failed to strike in five starts but three placed efforts show he is not devoid of promise and he looks capable of winning a race like this if taking to obstacles. Catterick: 12.30 Snapping Turtle, 1.00 Needwood Park, 1.30 Acrai Rua, 2.00 Frederic, 2.30 Tradewinds, 3.00 Moss Cloud, 3.30 Carobello. Leicester: 1.10 Un Anjou, 1.40 Relic Rock, 2.10 Ray Diamond, 2.40 Ginjo, 3.10 KILLALA QUAY (NAP), 3.40 Retrieve. Lingfield: 11.45 Must Have, 12.15 Kaufmann, 12.45 Clovelly Bay, 1.15 Haaf A Sixpence, 1.45 Cousin Khee, 2.15 Temple Road, 2.50 Pearl Ransom, 3.20 Indus Valley. Double: Killala Quay and Retrieve.